← Restorative Justice for Efrin Carrillo? 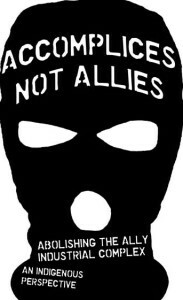 Much buzz lately on what defines an “ally.” Below are my thoughts after reading “Accomplices Not Allies” which is posted on Indigenous Action Media. Just read the article Accomplices Not Allies on the ally-industrial complex. I’m with the writer—but for probably different reasons. “Ally” has been imbued with so much meaning and carries so much hurt and disagreement that it’s no longer useful. The whole notion of “ally” originated with people of color—my first exposure was with black lesbians—who were tired of white people up in their business. Go do your own work and then when you understand things, come around and join the struggle for liberation. Or, in the words of the article, become an accomplice in taking apart the white supremacist, capitalist, homophobic, etc. and so on system. One central learning from “doing your own work” is recognizing how your own social location limits your understanding and you need input from many perspectives. Especially those most marginalized and difficult to hear from. This requires ongoing self education and humility. Most of the points being made by folks complaining about “allies” are pretty much the same ones we white dykes heard back in the 1980s. We were claiming “sisterhood” (not “allyship”) but those claims were often based on the same ignorance and unconscious belief in our own superiority. Check out Sarah Shulman’s Gentrification of the Mind for an insightful analysis of how radical thought becomes “gentrified” and the repercussions that has on community organizing and the life of radical creative communities. I feel that she is talking about the underlying process occurring now, which is reflected in many of the situations discussed in “Accomplices Not Allies. Her book is based in the AIDs crisis and the power of groups like ACT UP. After the devastating legacy of death, radical queer groups became co-opted by mainstream ideas and rerouted into marriage equality. There is way more examined in the short book. I highly recommend it as it addresses the central issues we all face in working for radical change.